UPDATE: Youssou N'Dour concert is cancelled. They are offering full refunds or you can select another show. 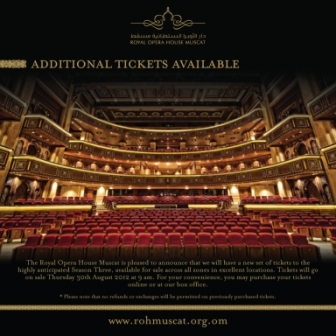 Last Thursday, the 30th of August, the Royal Opera House Muscat announced that they were releasing a third block of tickets for the upcoming season for those wanting to attend one or some of the events coming up. This outdoor event is free to the public. March 27, Le Mystère des voix Bulgares, Bulgaria. So, quite a long list of events there! The military music of Oman free event should be fun.